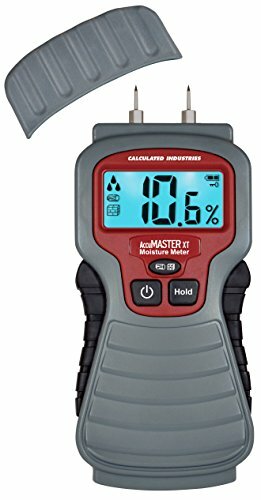 The AccuMASTER XT Moisture Meter is ideal for measuring moisture content in firewood, lumber, brick, concrete, drywall and plaster . PRO AND DIY REMODELERS can quickly discover hidden water damage in floors, walls and under carpets due to roof leaks, flooding, burst pipes, underground seepage or other water infiltration sources. Now you can prevent further damage and avoid toxic mold or other health risks. WOODWORKERS AND CRAFTSMEN can easily check moisture content percentage before purchasing or using expensive lumber and hardwoods. HOMEOWNERS AND CAMPERS can make sure their firewood is ready to use and avoid slow-starting, smoky fires. EASY ON THE EYES -- The AccuMASTER’s large, well-designed LCD display and always-on backlight means you can easily read it in dimly lit lumberyards, jobsites, workshops, or even out at your wood pile on a cold winter night. Plus, the handy Hold function lets you freeze a reading on the display for viewing at a more convenient angle. USER FRIENDLY, SIMPLE TO UNDERSTAND -- Just pop off the protective cover, then firmly push the (replaceable) sharp, stainless steel pins into the material you wish to measure. The easy-to-read digits and clearly-designed icons tell you immediately if the Moisture Content is High, Medium or Low. Plus, there are also audible High, Medium, Low alerts so you will be able to hear the level even if you are in a dark or awkward space where you can’t see the screen. The sturdy, hand-friendly shape and rubber side grips let you take multiple measurements in comfort. COMES COMPLETE -- The sturdy AccuMASTER XT Moisture Meter offers accuracy and user-friendly features. Includes a 9-volt battery, battery-saving auto shut-off (3 mins), User’s Guide and a one-year warranty. Make sure your wood or building material is ready to use – click Add to Cart now! Copyright 2017 Calculated Industries. All rights reserved. If you have any questions about this product by Calculated Industries, contact us by completing and submitting the form below. If you are looking for a specif part number, please include it with your message.